Have you ever dreamt of acquiring the most amazing collection of robots? What about being able to take them apart and rebuild them to bring the machines of your imagination to life? Well, here's your chance. 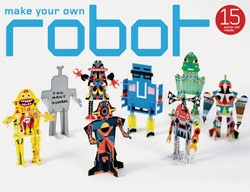 This box-set includes fifteen different robot templates designed by Roger Fawcett-Tang, twelve of which have been illustrated and customized by a different trend-setting artist. Though varying in shape, the parts are interchangeable. Three blank DIY sheets also allow you to customize the templates with your very own designs. For robot obsessives of all ages, this playful but also intensely desirable object should become a collector's item in no time. Make sure you buy more than one set, and put at least one aside for the future. They may not change the course of technology or space travel, but they will certainly form a colorful and animated line-up on your shelf.